There are some things in my home that I want to replace. Shower heads and sink faucets are some of those things. But I do have priorities. And spending a few hundred bucks on these things are somewhat low on that list. Eventually I’ll get new ones, but I may not get around to it for oh, a year. Or two. Or maybe even three. However, I do have a threshold for annoying crap, and these two things have about pushed me over the edge. What I don’t have is a few hundred bucks. But what I do have is about seven bucks. 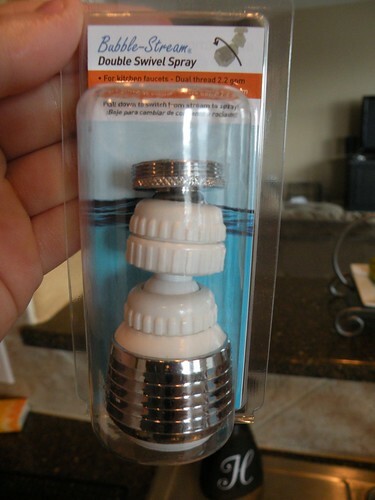 For starters, I got this handy dandy little nozzle for my kitchen sink for only $1.85. It will stream or spray the water and as an added bonus it has a swivel head. I still can’t get a big pot under the faucet, but at least I can spray and swivel now! 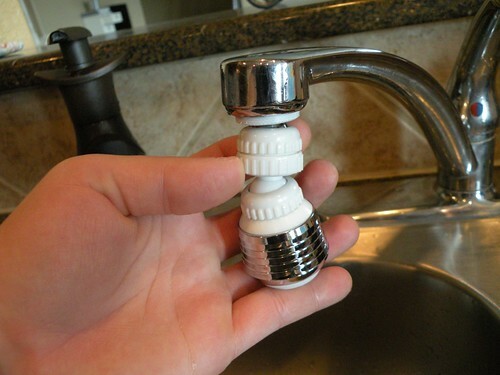 Every (well, most every) faucet has a piece at the end of it that can unscrew. Did you know that? Most people don’t know that. 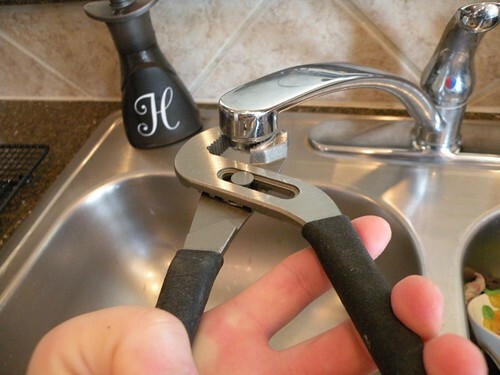 Just get some pliers or something and loosen the tip of the faucet up, and then unscrew the piece right off. Fo’ shizzle! Pretty cool, eh? All those little rocks are deposits from the water line. 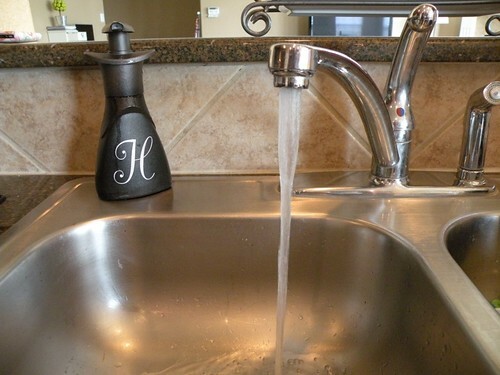 Side note: if your faucet starts running really slow or acting clogged, you may need to clean this out! Now take your bubble spray nozzle thing-a-ma-jiggy and wrap Thread Seal Tape around the threading. I can also get a SPRAY! And then I had this totally crap-tastic shower head in my shower. This thing sprayed at such a huge width that only about 10% of the water would actually hit you. The rest would bounce off every single wall. And if I opened the door with the water on, it would flood the bathroom. So, I took it off the same way I took the kitchen one off. And this piece came out, so I saved it for the new head I bought at our local hardware store for a grand total of $4.85. 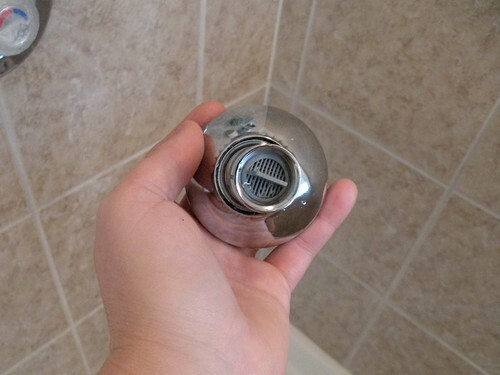 So I took the new shower head and I put that little piece inside it just like it was in the crappy one. Sorry for lack of pictures on this tutorial. I was actually about to get into the shower when I impromptu decided to change this head out. AKA I was neked. And guess what? All my pictures I took had a reflection of my neked body in them. Yikes! Note to self: If something acts like a mirror, don’t take pictures while naked. Oh, and don’t bother trying to look. That’s my HAND reflection, mmm-kay? Also, I wrapped the Thread Seal Tape around the threads on the pipe sticking out from the wall as well. If you are working with water/plumbing, you need to wrap the threads so they don’t leak! Then, just screw the new head back on and tighten it with some pliers or whatever you can find that you think might work. Ah, a shower head that actually streams towards my head, not towards each wall on either side of me. It’s the simple things in life really. Maybe one day I’ll get real fancy with this shower, but for now I can take a quick shower without cursing profanities at the shower head. 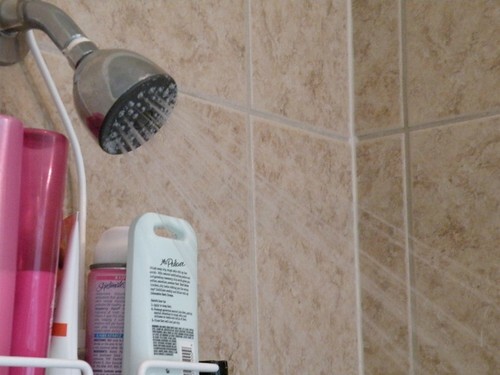 1) Changing fixtures and shower heads is way easier than you think. You can do it! 2) These are not what I want long-term, but I’m still not going to spend the next 4 years suffering with something totally crappy when I can have something that’s only kinda crappy. If you can’t afford that super expensive nice one you want, just spend a teensy tiny bit of money for a small upgrade to last you until you can afford the one you really want. It will make life so much more pleasant. Oh, and in case you are wondering, I tackled each project in about 5 minutes. And that included time to stop at each step and take pictures. So really, it’s like a 3 minute deal. You better watch out, you could be on your way to being a full fleged home renovation contractor if you don’t slow down on the repairs!! Just an FYI~ the gray piece is a flow restrictor. 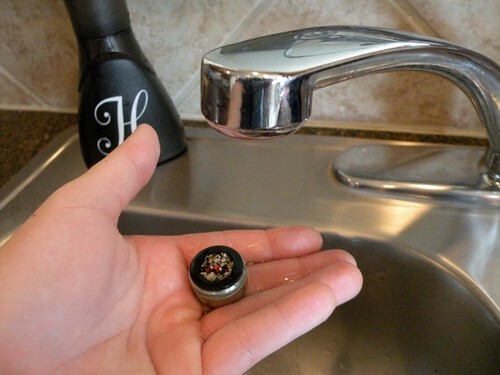 I personally remove all those dang things from every new faucet we purchase.My husband thinks it’s like removing the textile tag from furniture. I set him straight one day and said read the tag, we are the “buyer” so we can rip them off. Same with the flow restrictors. I am the buyer so in the trash they go. A certain amount of water has to flow through my hair before the shampoo is rinsed. Standing in the shower longer because the flow is slow is just silly in my book. 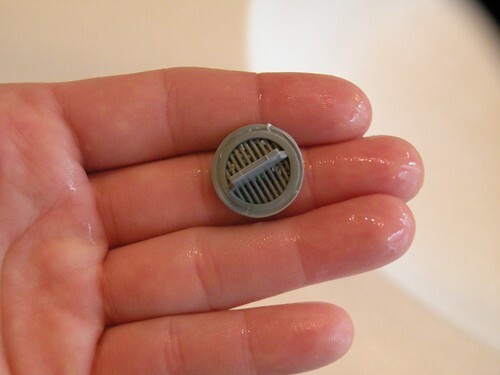 So if you notice the pressure from shower heads is less than desirable, try removing the flow restrictors first. 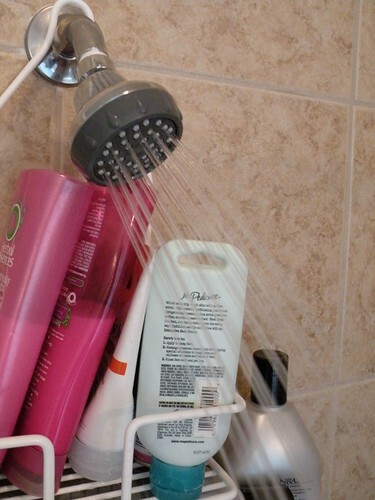 It may be just enough to hold off buying a new shower head. Nice job though, and at a reasonable price. I agree…and what you did looks easy enough to do! We lived in a house where the kitchen was designed to only be pretty in pictures. Functional wasn’t even close to a concept when that room was designed, but it was “small” things that you didn’t notice until you tried to cook in it. Or move around with a table in it. Smart people sell a house like that EMPTY. I digress. I had a similar kitchen sink issue; I decided was worth more than trying to not slosh water around, off the side of the pot or worse, so I went thrifting for a pretty pitcher. Something I truly liked seeing every day. 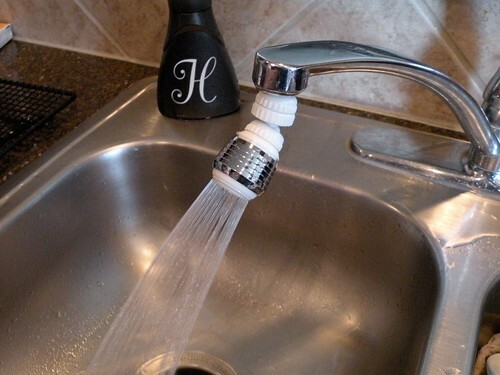 I could turn it sideways, put it under the faucet, maneuver it easily and best yet, it was PRETTY. LOL Just another solution or a “compounding” one. Love that you did it yourself! It will work great until you can get the dream items! Good job! Great tutorials! I think we’ll try out both of these when we move into our new apartment. You. Crack. Me. Up. Seriously!! I was laughing hysterically about the neked reflections!!!!!!! OMG I’m not the only crazy person that does things at the drop of a hat – with clothes or without!! LMAO over here, Allison! Your posts are just hilarious. Doesn’t everyone who owns a blog take pics “neked” once in a while?! My mom has that same kitchen sink thing, it’s amazing. But when we got one it didn’t fit the faucet we had (in one of the houses we lived in) so we had to return it…fyi-keep receipt and packaging! I just spurted my Pepsi. Thanks. 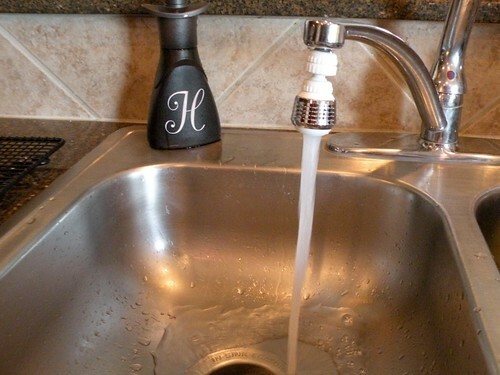 I love my kitchen faucet thingie, too! 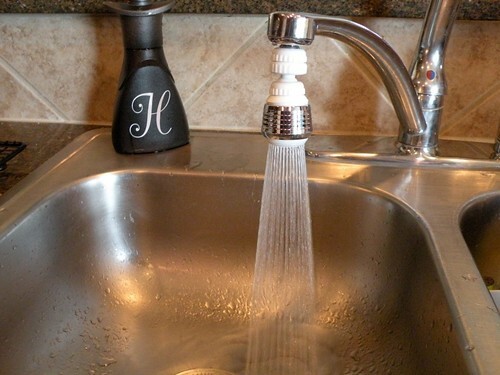 But with my gooseneck faucet, I have to be careful how hard I pull or push on the sprayer nozzel- I made the faucet leaky over a period of time and got a scolding from the hubby when he had to fix it. 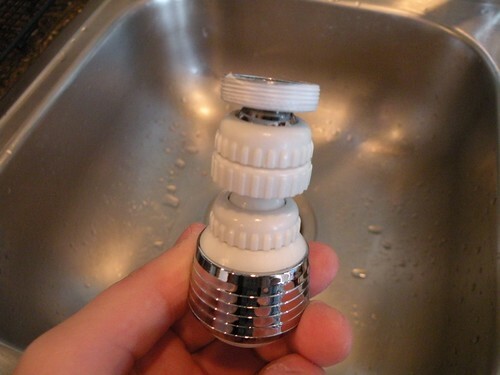 Also if your faucet sprayer thingie breaks, save it! After a couple of years, ours did and hubby cobbled together the hingie part from the old one plus the new one for a double hinged one! Yeah, he’s kinda McGyver-ish. Hey! Pretty cool!! You did a terrific job and I loved the photos!! Easy peazy!! I am glad you found stuff to help you out! My husband and I had a hard time finding a shower head that we liked. We were not willing to spend over $75 on one, which was pointless because after trying about 3 different ones close to that price we could have bought one for around $250. We felt we should be able to get a decent shower head for that. Anyways in desperation we looked in Walmart and bought the cheapest shower head they had (around $5) and we LOVE, LOVE, LOVE it!! The water pressure is perfect and it goes where we need it to go. I learned sometimes more expensive is not better on that project! Jen, I would like to personally thank you for giving me a heart attack. No, seriously. Thank you. I double and triple checked and I’M NOT NAKED in any photos! The only reflection in any of them is my hand!